The gifted Japanese animator behind "Wolf Children" talks about keeping his latest film all in the family. When Mamoru Hosoda became a father a second time, his heart filled with joy. He was taken by surprise when he found himself more inspired professionally than distracted from his work with his first child, a son, and when adding a daughter to the mix, the idea for a new film was born as well. 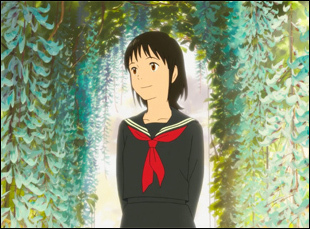 For the director of such fantasies as “Wolf Children” and “The Boy and the Beast,” it was reality that may have taken a little imagination to figure out as a compelling narrative, but “Mirai” is one of Hosoda’s most moving films to date, getting inside the thoughts of a four-year-old named Kun when his new sister Mirai arrives home to flip his understanding of the world as radically as his arrival did for his parents. 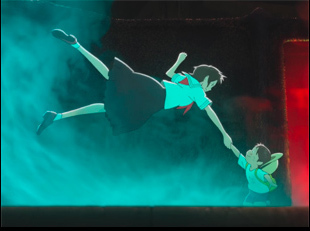 While the animation is as sophisticated as one could expect from Hosoda’s Studio Chizo, it is matched by the director’s depiction of the family at the center of the story, observing how baby Mirai not only requires attention for her needs, but leads others to consider where they are in their own lives and whether they’re doing enough for themselves to be fulfilled and for each other. 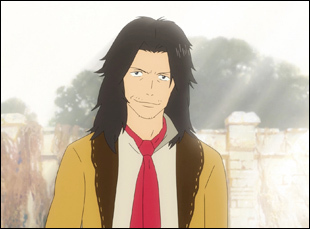 In the case of Kun, a literal path of cookie crumbs leads him outside the family’s humble home to find adventure awaiting in his own backyard, his mind racing with possibilities as he comes to meet a man named the Prince, whose behavior bears a strong resemblance to the family’s dog Yukko, and a teenage girl he eventually discovers is a grown version of his new sister, allowing him a peek into the future when he’s uncertain of his place in the present. Although Kun gingerly steps into these other realms, Hosoda stealthily moves around the young boy’s mind as he grows more conscious of the world around him and starts to understand that he needn’t be afraid that Mirai will somehow replace him but in fact she will help expand his horizons. Just watching “Mirai” seems to have the same effect on audiences, ever since the film debuted at the Director’s Fortnight at the Cannes Film Festival earlier this year and Hosoda, who has been on quite a whirlwind adventure himself in recent months, spoke through a translator about how happy he’s been to find his most personal film to perhaps be his most universal while at the Animation is Film Festival in Los Angeles, as well as how he went about telling the story from the point of view of such a young protagonist. What’s it like getting into the mind of a four-year-old? When you think about making a protagonist four years old, that seems reckless because that’s so young. How can you come up with a story when they haven’t really experienced anything? And as adults, you deal with the kids like we have to teach them something, but it’s actually the opposite. When I spend time with kids, they’re the ones who teach me because you get to live through your own childhood again. It reminds you of what you felt, so you get the feeling of being a four-year-old again. Did it change how you structured the film? Yes. In my past films, I went with the traditional structure of the story being in three parts, but because a child is a protagonist, I went with a five-part story, more like a novel or an anthology and while I was drawing the different parts, it was interesting because then I needed a common theme to connect all the different parts. It was refreshing to see the parents questioning themselves. Was that important for you to convey? Yeah, because I think in a lot of children’s movies, parents tend to only exist to play the role of being a parent, but that’s not exactly the case in real life. As parents raise their child, they also grow themselves – they change and improve. They’re imperfect. They have to be. So I’m hoping the children that are watching the movie would learn that parents also have different roles that are separate from their [role as parents]. They have their work lives. They have personal lives. Understanding and accepting that was important in depicting a true family. One of my favorite things in the film is the house – it’s a humble multi-level home that you’re able to move through in really wonderful ways since it’s almost constructed like three steps that you can move up and down on. How did you design it? Yeah, it is a weird house. [laughs] It’s nothing like a traditional Japanese house. It’s on a hill, so there’s a bunch of stairs and another distinction is there’s no walls to separate the rooms. It’s really the levels that determine the function of the room, and it was important is that we don’t have walls, just windows, because this is a story of a child learning the family secrets, so I wanted to make it transparent, so the family could see what everyone else was doing. It symbolizes what this movie is about, so in order to design this house, I didn’t ask my art director to design the house. I asked an actual architect, so if someone wanted to actually build that house, they really could. You feel so much life inside. Did you do anything special in working with your voice cast to make it feel so spontaneous? For casting, we really couldn’t have a four-year-old do it because they have difficulty acting and it just doesn’t sound like a four-year-old on screen. Usually in Japan, we have females do the voices of young boys, so I was thinking, “Oh are we going to get a 30-year-old or 40-year-old?” But actually, we cast an 18-year-old named Moka Kamishiraishi. Her voice was so perfect, every time I heard it in the studio, I kept thinking she was really a four-year-old boy and then I directed her as if she were a four-year-old boy. [laughs] And then because the cast was so small because it’s just a small family, the cast really all got along just really like a family and it was a really good atmosphere, so maybe that’s reflected in the movie. I’ve heard you may have based a fair amount of the dialogue on real conversations that you heard – are you keeping your ears open? Was there any sequence in the film that was particularly difficult to pull off? The hardest part was the train station scene because that’s an important scene where [Kun] loses himself and forgets who he is, so I wanted to represent that in a station that would look like a nightmare. We say it’s Tokyo Station [in the film], but [in real life] Tokyo Station is only 30 minutes from our studio [and so familiar to us], so we actually flew in a plane 12 hours to check out London and Paris’ old train stations because then it would be a station that we never really looked at [ourselves]. It would be vast and scary to us, just how Kun would feel at Tokyo Station, so It looks like a nightmare, even to adults. The conductor he encounters is a truly inspired bit of design with his head looking like a stopwatch. This movie is about a family that lives in a small corner of Japan, but showing it worldwide, even though people have different lives and different circumstances, they all watch it and they think of it as their own story because the tour actually started in Asia and then I went to Europe and Spain, London, Hamburg…everywhere it’s the same. They feel something that even the Japanese audience feels, so I’ve been happy for that. I always think that showing your movies is introducing yourself to strangers and trying to be friends with the audience and I really feel like I was successful in making friends with a bunch of different people in different parts of the world. “Mirai” opens in limited release on November 30th. A full list of theaters and dates is here.